DOSBox emulates the command-line interface of DOS. In computing, an emulator is hardware or software that enables one computer system (called the host) to behave like another computer system (called the guest). An emulator typically enables the host system to run software or use peripheral devices designed for the guest system. Emulation refers to the ability of a computer program in an electronic device to emulate (or imitate) another program or device. Many printers, for example, are designed to emulate Hewlett-Packard LaserJet printers because so much software is written for HP printers. If a non-HP printer emulates an HP printer, any software written for a real HP printer will also run in the non-HP printer emulation and produce equivalent printing. Since at least the 1990s, many video game enthusiasts have used emulators to play classic (and/or forgotten) arcade games from the 1980s using the games' original 1980s machine code and data, which is interpreted by a current-era system. Basilisk II emulates a Macintosh 68k using interpretation code and dynamic recompilation. 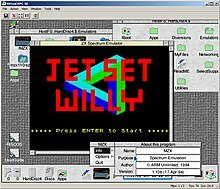 Windows XP running an Acorn Archimedes emulator, which is in turn running a Sinclair ZX Spectrum emulator. Tetris running on the Wzonka-Lad GameBoy emulator on AmigaOS, itself running on E-UAE on a modern Fedora Linux system. In contrast, some other platforms have had very little use of direct hardware addressing, such as an emulator for the PlayStation Vita. In these cases, a simple compatibility layer may suffice. This translates system calls for the foreign system into system calls for the host system e.g., the Linux compatibility layer used on *BSD to run closed source Linux native software on FreeBSD, NetBSD and OpenBSD. For example, while the Nintendo 64 graphic processor was fully programmable, most games used one of a few pre-made programs, which were mostly self-contained and communicated with the game via FIFO; therefore, many emulators do not emulate the graphic processor at all, but simply interpret the commands received from the CPU as the original program would. Developers of software for embedded systems or video game consoles often design their software on especially accurate emulators called simulators before trying it on the real hardware. This is so that software can be produced and tested before the final hardware exists in large quantities, so that it can be tested without taking the time to copy the program to be debugged at a low level and without introducing the side effects of a debugger. In many cases, the simulator is actually produced by the company providing the hardware, which theoretically increases its accuracy. Math co-processor emulators allow programs compiled with math instructions to run on machines that don't have the co-processor installed, but the extra work done by the CPU may slow the system down. If a math coprocessor isn't installed or present on the CPU, when the CPU executes any co-processor instruction it will make a determined interrupt (coprocessor not available), calling the math emulator routines. When the instruction is successfully emulated, the program continues executing. This article's section named "Structure of an emulator" needs additional citations for verification. Please help improve this article by adding citations to reliable sources. Unsourced material may be challenged and removed. It is possible for the memory subsystem emulation to be reduced to simply an array of elements each sized like an emulated word; however, this model fails very quickly as soon as any location in the computer's logical memory does not match physical memory. This clearly is the case whenever the emulated hardware allows for advanced memory management (in which case, the MMU logic can be embedded in the memory emulator, made a module of its own, or sometimes integrated into the CPU simulator). Even if the emulated computer does not feature an MMU, though, there are usually other factors that break the equivalence between logical and physical memory: many (if not most) architectures offer memory-mapped I/O; even those that do not often have a block of logical memory mapped to ROM, which means that the memory-array module must be discarded if the read-only nature of ROM is to be emulated. Features such as bank switching or segmentation may also complicate memory emulation. As a result, most emulators implement at least two procedures for writing to and reading from logical memory, and it is these procedures' duty to map every access to the correct location of the correct object. Interpreters are very popular as computer simulators, as they are much simpler to implement than more time-efficient alternative solutions, and their speed is more than adequate for emulating computers of more than roughly a decade ago on modern machines. However, the speed penalty inherent in interpretation can be a problem when emulating computers whose processor speed is on the same order of magnitude as the host machine[dubious – discuss]. Until not many years ago, emulation in such situations was considered completely impractical by many[dubious – discuss]. Various forms of dynamic recompilation, including the popular Just In Time compiler (JIT) technique, try to circumvent these problems by waiting until the processor control flow jumps into a location containing untranslated code, and only then ("just in time") translates a block of the code into host code that can be executed. The translated code is kept in a code cache[dubious – discuss], and the original code is not lost or affected; this way, even data segments can be (meaninglessly) translated by the recompiler, resulting in no more than a waste of translation time. Speed may not be desirable as some older games were not designed with the speed of faster computers in mind. A game designed for a 30 MHz PC with a level timer of 300 game seconds might only give the player 30 seconds on a 300 MHz PC. Other programs, such as some DOS programs, may not even run on faster computers. Particularly when emulating computers which were "closed-box", in which changes to the core of the system were not typical, software may use techniques that depend on specific characteristics of the computer it ran on (e.g. its CPU's speed) and thus precise control of the speed of emulation is important for such applications to be properly emulated. Video game console emulators are programs that allow a personal computer or video game console to emulate another video game console. They are most often used to play older 1980s-era video games on 2010s-era personal computers and more contemporary video game consoles. They are also used to translate games into other languages, to modify existing games, and in the development process of "home brew" DIY demos and in the creation of new games for older systems. The Internet has helped in the spread of console emulators, as most - if not all - would be unavailable for sale in retail outlets. Examples of console emulators that have been released in the last 2 decades are: RPCS3, Dolphin, Cemu, PCSX2, PPSSPP, ZSNES, Xenia, Citra, ePSXe, Project64, Visual Boy Advance, nullDC, Nestopia, and Yuzu. As computers and global computer networks continued to advance and emulator developers grew more skilled in their work, the length of time between the commercial release of a console and its successful emulation began to shrink. Fifth generation consoles such as Nintendo 64, PlayStation and sixth generation handhelds, such as the Game Boy Advance, saw significant progress toward emulation during their production. This led to an effort by console manufacturers to stop unofficial emulation, but consistent failures such as Sega v. Accolade 977 F.2d 1510 (9th Cir. 1992), Sony Computer Entertainment, Inc. v. Connectix Corporation 203 F.3d 596 (2000), and Sony Computer Entertainment America v. Bleem 214 F.3d 1022 (2000), have had the opposite effect. According to all legal precedents, emulation is legal within the United States. However, unauthorized distribution of copyrighted code remains illegal, according to both country-specific copyright and international copyright law under the Berne Convention. [better source needed] Under United States law, obtaining a dumped copy of the original machine's BIOS is legal under the ruling Lewis Galoob Toys, Inc. v. Nintendo of America, Inc., 964 F.2d 965 (9th Cir. 1992) as fair use as long as the user obtained a legally purchased copy of the machine. To mitigate this however, several emulators for platforms such as Game Boy Advance are capable of running without a BIOS file, using high-level emulation to simulate BIOS subroutines at a slight cost in emulation accuracy. ^ Warick, Mike (April 1988). "MS-DOS Emulation For The 64". Compute!. p. 43. Retrieved 10 November 2013. ^ "What is emulation?". Koninklijke Bibliotheek. Retrieved 2007-12-11. ^ van der Hoeven, Jeffrey, Bram Lohman, and Remco Verdegem. "Emulation for Digital Preservation in Practice: The Results." The International Journal of Digital Curation 2.2 (2007): 123-132. ^ a b Muira, Gregory. " Pushing the Boundaries of Traditional Heritage Policy: maintaining long-term access to multimedia content." IFLA Journal 33 (2007): 323-326. ^ Rothenberg, Jeffrey (1998). ""Criteria for an Ideal Solution." Avoiding Technological Quicksand: Finding a Viable Technical Foundation for Digital Preservation". Council on Library and Information Resources. Washington, DC. Retrieved 2008-03-08. ^ Miura, Gregory (2016). "Pushing the Boundaries of Traditional Heritage Policy: Maintaining long-term access to multimedia content". IFLA Journal. 33 (4): 323–6. doi:10.1177/0340035207086058. ^ Verdegem, Remco; Lohman, Bram; Van Der Hoeven, Jeffrey (2008). "Emulation for Digital Preservation in Practice: The Results". International Journal of Digital Curation. 2 (2): 123–32. doi:10.2218/ijdc.v2i2.35. ^ "Mega Man Star Force - The Cutting Room Floor". tcrf.net. ^ "Echoes of Art: Emulation as preservation strategy". Retrieved 2007-12-11. ^ Peter Magnusson (2004). "Full System Simulation: Software Development's Missing Link". ^ "Debugging and Full System Simulation". ^ Vania Joloboff (2009). "Full System Simulation of Embedded Systems" (PDF). ^ PSVEP. "PlayStation Vita Emulator Project". Retrieved 2017-08-08. ^ Pugh, Emerson W. (1995). Building IBM: Shaping an Industry and Its Technology. MIT. p. 274. ISBN 0-262-16147-8. ^ "IBM Archives: 7090 Data Processing System (continued)". www-03.ibm.com. 23 January 2003. ^ "System Compatibility Operations". Reference Manual IBM 7090 Data Processing System (PDF). March 1962. pp. 65–66. A22-6528-4. ^ "System Compatibility Operations". IBM 1410 Principles of Operation (PDF). March 1962. pp. 56–57, 98–100. A22-0526-3. ^ Tucker, S. G (1965). "Emulation of large systems". Communications of the ACM. 8 (12): 753–61. doi:10.1145/365691.365931. ^ "Network simulation or emulation?". Network World. Network World. Retrieved 22 September 2017. ^ "The Emulation Imitation". Malwarebytes Labs. Retrieved 2016-05-30. This page was last edited on 17 March 2019, at 11:31 (UTC).